DIAMOND BAR >> County officials renewed a $20,000 reward this week for information leading to the capture and conviction of the person or people who “savagely” stabbed a Diamond Bar couple to death during an apparent home-invasion robbery last year. 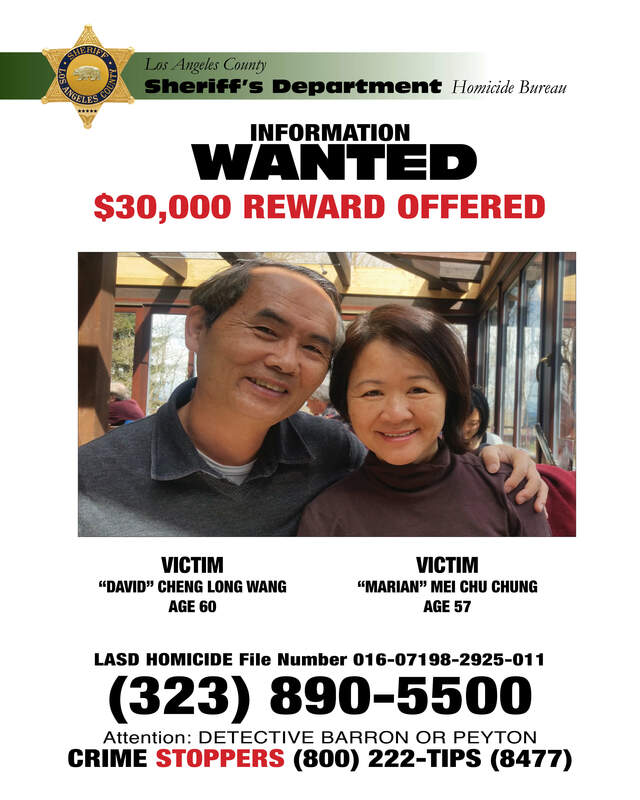 A family friend who went to check on Chen “David” Long Wang, 60, and Mei “Marian” Chu Chung, 57, found them stabbed to death on Oct. 20, 2016, at their house in the 3300 block of Bent Twig Lane, according to Los Angeles County sheriff’s and coroner’s officials. The Los Angeles County Board of Supervisors offered a $20,000 reward for information on the slaying in March. The reward west set to expire this week, prompting Supervisor Janice Hahn and the Board of Supervisors to renew the reward on Tuesday for another 90 days. The $20,000 in reward money offered by the county is complimented by another $10,000 in reward money offered in the case by the City of Diamond Bar, for a total available reward of $30,000. Wang was described by family and investigators as a retired computer programmer, and Chung was a retired teacher and art instructor. They are survived by two children, who are both medical doctors, and several grandchildren. “If you have any information pertaining to the murder of Marian and David, I urge you to come forward. They deserve justice. Their children and grandchildren deserve answers,” Hahn said. Anyone with information related to the murder should call sheriff’s homicide Detectives Margarita Barron or Dameron Peyton at (323) 890-5500. Tips may also be submitted anonymously to L.A. Regional Crime Stoppers at 800-222-8477. During Tuesday’s Los Angeles County Board of Supervisors meeting, “The Board of Supervisors unanimously approved a motion by Supervisor Kathryn Barger establishing a $10,0000 reward for information leading to the arrest and/or conviction of a suspect or suspects responsible for the murder of Kirinda Morehead,” Barger’s spokesman, Tony Bell, said in a written statement. EL MONTE >> A reward for information leading to justice for an El Monte man shot to death during a botched robbery at a Jack in the Box restaurant last month continues to grow, as city officials in El Monte and Jack in the Box representatives have announced plans to add to a $20,000 reward already offered by the Los Angeles County Board of Supervisors, authorities said. Juan Miguel Vidal, 25, was working at the restaurant about 7:30 p.m. on Oct. 21 when the unidentified, masked gunman jumped over the counter of the restaurant, 9220 Flair Drive, demanded money and immediately opened fire, Los Angeles County sheriff’s officials said. Vidal, who was engaged to be married and had recently graduated pharmacy technician school, died from his injuries at a hospital, officials said. His killer fled empty-handed and remains at large. An accomplice believed to have served as the getaway driver of a dark-colored sedan in which the shooter fled is also being sought, Detective Adan Torres of the sheriff’s Homicide Bureau said. In hopes of generating tips from the public, the Los Angeles Count Board of Supervisors authorized a $20,000 reward for information leading to the arrest and conviction of those responsible for Vidal’s slaying on Wednesday. The El Monte City council plans to announce the city will be contributing to the award amount during a press conference on Monday, according to El Monte police Lt. Christopher Cano. The amount the city will be adding was not available. 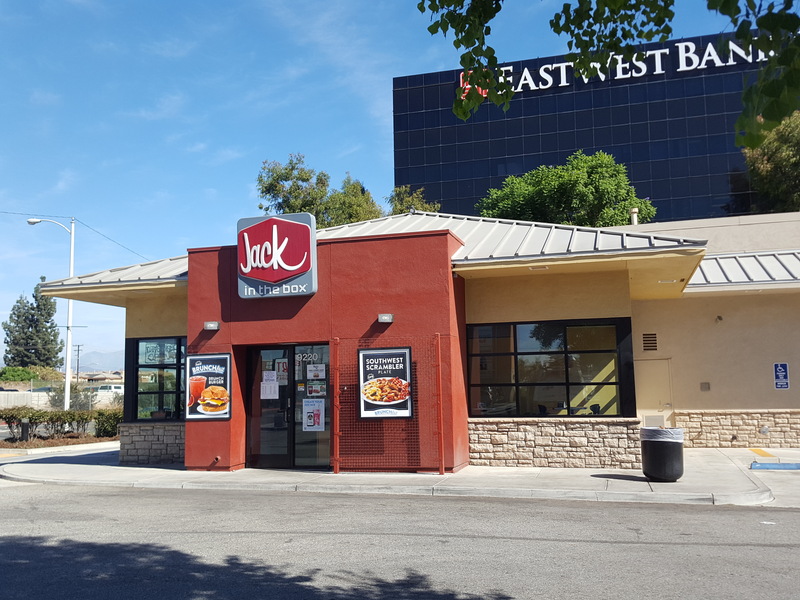 “Additionally, John Maki, owner of the franchised Jack in the Box restaurant where Juan Vidal worked, and Oscar Hurtado, representing Jack in the Box corporate, both added $5,000.00 dollars each to the reward,” Cano said in a written statement. EL MONTE >> Authorities offered up a $20,000 reward on Wednesday for information in the fatal shooting of a 25-year-old worker during a botched robbery at an El Monte Jack in Box restaurant last month. Juan Manuel Vidal died following the shooting, which took place on Oct. 21 inside the restaurant, 9220 Flair Drive. He was working about 7:30 p.m. when a masked gunman jumped over the counter, “demanded money, and then shot the victim almost immediately,” Los Angeles County Sheriff Jim McDonnell said. The deadly shooting was caught on video by restaurant surveillance cameras. “The suspect appeared to panic, jumped back over the counter and fled the location through the north door onto Flair Drive,” he said. No money was obtained. Vidal, who as engaged and was looking forward to starting a new career having recently graduated pharmacy technician school, succumbed to his injuries at a nearby hospital. The Los Angeles County Board of Supervisors voted to authorize a $20,000 reward for information leading to the capture and conviction of the unidentified gunman. Vidal’s mother, Mary Smay, implored anyone with information to come forward. “I really want the police to get the man who did this to my son. He needs to pay for all the pain and suffering that he’s caused to so many people… people that loved my son,” she said. Sheriff Jim McDonnell also urged anyone with information to do the right thing. “This is a tragic incident we want to talk about and really, truly ask the public’s help in solving this case,” McDonnell said. The reward was proposed by Supervisor Hilda Solis. In addition to the gunman, detectives believe at least one accomplice served as a getaway driver in the crime, speeding the killer away in a dark-colored sedan, Detective Adan Torres of the sheriff’s Homicide Bureau said. Funds to help Vidal’s family are being collected online at www.gofundme.com/2vh4f5w. 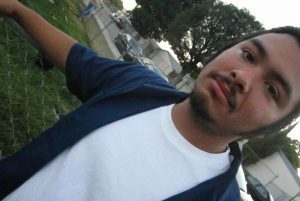 PASADENA >> The Los Angeles County Board of Supervisors approved a $20,000 reward Tuesday for information leading to the arrest and/or conviction of those responsible for the murder of an Altadena man last December. Robert Arthur Calderon, 27, was gunned down about 10:45 p.m. on Dec. 18 in the 600 block of North Mentor Avenue, according to Pasadena police and Los Angeles County coroner officials. The case remains unsolved. Raised in the Altadena and Pasadena areas, Calderon attended St. Elizabeth Parish School in Altadena, then St. Francis High School in La Cañada Flintridge and Pasadena High School before ultimately obtaining his diploma from Pasadena City College, his mother, Sarah Mendoza-Jaime, said. 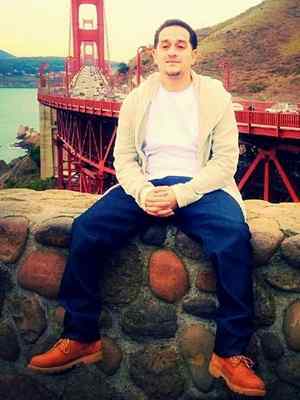 His family has worked tirelessly to seek justice ever since Calderon’s slaying, posting flyers near the crime scene and at Calderon’s hang-outs. “On behalf of Robert Arthur Calderon’s family we want to thank Mike Antonovich and the Los Angeles County Board of Supervisors for making the funds available to assist in my sons murder,” said Mendoza-Jaime, a longtime program coordinato at the Foothill Workforce Development Board in Pasadena. “Our hopes are that by offering a reward the public will come forth and assist in finding those responsible for his heinous murder,”sje said. Mendoza-Jaime said she had been trying to get an award established through Pasadena officials for months with no success. When the Los Angeles County Board of Supervisors offered an award this week, she said she asked the city about contributing as well, to no avail. Anyone with information can reach Pasadena police Detective Tim, Bundy at (626) 744-3861 or the Pasadena Police Department at 626-744-4241. Tips may also be submitted anonymously to L.A. Regional Crime Stoppers at 800-222-8477. PHOTO of Robert Calderon, courtesy. 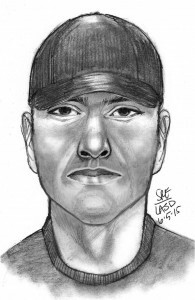 SAN DIMAS >> Authorities released a suspect sketch and offered a $20,000 reward Wednesday for information leading to the arrest and conviction of gunman who fatally shot a San Dimas sandwich shop owner during a robbery last week. Investigators also released a suspect sketch in connection with the June 2 shooting a Quiznos restaurant at 1034 Arrow Highway that fatally wounded owner Pravin “Peter” Patel, 62. The unidentified shooter was as a white or Latino man in his early-20s, about 6 feet to 6 feet 1 inch tall and 180 pounds. During the crime, he wore a black T-shirt, plaid shorts and a baseball cap. The office of Los Angeles County Supervisor Michael Antonovich authorized the reward. Patel was working as usual when the robber entered the sandwich shop, brandished a handgun and demanded money, officials said. Patel handed over the money from the register to the robber, who threatened to harm the two customers inside the store if he did not, Coleman said. Patel then followed the robber outside. “As Mr. Patel exited the restaurant, a struggle ensued between he and the suspect,and Mr. Patel was shot and mortally wounded,” Coleman said. The brazen and deadly daytime was “very unusual” for the area, Capt. Duane Harris of the Sheriff’s San Dimas Station said. “This is appropriately described as a quiet community,” he said. A large memorial of flowers and candles sat in front of Quiznos shop Wednesday. Family members did not wish to comment. 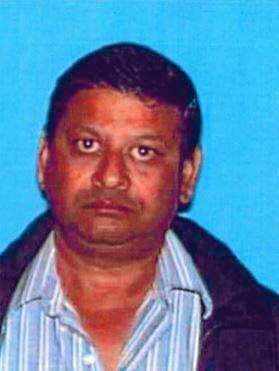 Monrovia police Lt. Mike Lee said he knew Patel since before he bought his Quiznos restaurant, when he owned a video store on Arrow Highway and Sunflower Avenue. Lee described Patel as a soft spoken man who always treated customers nicely. A candlelight vigil is planned for 7 p.m. Friday in front of the Quiznos store. A website collecting donations to help Patel’s family has been established at www.youcaring.com/pravin. SAN DIMAS — A law enforcement union announced a $10,000 reward Thursday for information leading to the arrest of a 19-year-old El Monte man accused of stealing two bags containing sheriff’s badges and identification cards from the Raging Waters park in San Dimas in September. Randy Sandoval has been identified as one of two suspects in the Sept. 22 theft at the amusement park, which was closed to the public for a private gathering of Los Angeles County Sheriff’s Department employees, Lt. Janice Banks of the Sheriff’s Parks Bureau said. The two bags stolen belonged to off-duty deputies assigned to the sheriff’s Palmdale Station. He was identified via a surveillance photo obtained at a store where a credit card taken in the theft was used within hours of the crime, officials said. A photograph of Sandoval, whose identity was not known at the time, along with a female accomplice was first published by sheriff’s officials Oct. 17. Help from the public results in the arrest of a 17-year-old girl in connection with the crime, as well as the identification of Sandoval, officials from the Sheriff’s Parks Bureau said in a written statement. In hopes of tracking down the remaining suspect and getting back the stolen items, the Association for Los Angeles Deputy Sheriff’s, which hosted the September event at Raging Waters, has offered a $10,000 reward for information leading to the arrest and conviction of Sandoval. The bags were taken from inside an employee break room in front of the park’s security office, Banks said. In the three hours that followed, a credit card stolen from one of the off-duty deputies was used to rack up about $670 in charges at businesses in San Dimas, West Covina and Baldwin Park. 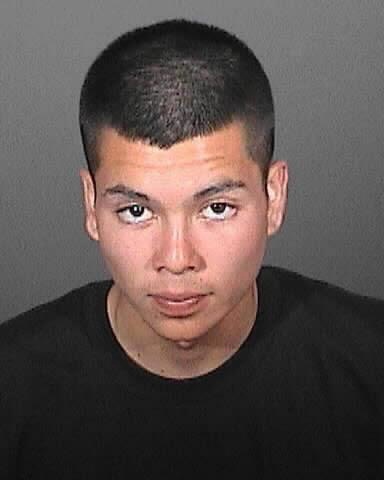 PHOTO of Randy Sandoval, 19, of El Monte courtesy of the Los Angeles County Sheriff’s Department. The Board of Supervisors is about to extend the time limit on the $10,000 reward offered for information leading to the arrest and conviction of two men suspected of killing Sammantha Salas in January. Salas was gunned down in a section of Monrovia known as “No Man’s Land.” Police believe her killing was the result of a series of escalating gang violence attacks between black and Latino gangs that took on racial overtones. The reward vote takes place Tuesday. Sheriff’s homicide Lt. Dan Rosenberg said Monday that all five juveniles suspected of taking part in the robbery that killed Covina Hills resident Michelle Chien at her home earlier this year will be tried as adults. One suspect, Victor Maurtua, 19, a member of the El Monte Flores gang remains at large in the case. Rosenberg also has a crew working alongside LAPD detectives in hopes that they can solve the slaying of Los Angeles County Sheriff’s Deputy Juan Escalante, 27. The deputy was slain outside his home two weeks ago, as he left for work at Men’s Central Jail. A U.S. Army reservist, Escalante had worked for the Sheriff’s Department for 2 1/2 years. He was assigned to the “high power” unit, where dangerous inmates — many of them violent gang members — are housed in single-man cells. Investigators said this week that the shot that killed Escalante was fired from behind him and that he may not have seen his killer or killers. Ropsenberg said deputies and officers are working alongside and getting along. The Supes are offering a $10,000 reward for information on the murder of Evelyn Mosley, according to a press release put out this afternoon. Mosley, 90, was killed last Thursday after a brief struggle in her home in the 3200 block of Lincoln Avenue in Altadena. Her body was discovered by fire fighters responding to a call at the home.